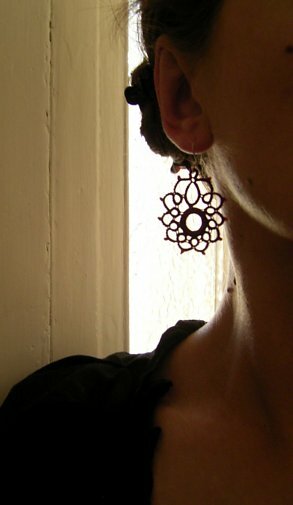 The first tatted earrings I ever saw were ballet pink, huge, and somehow apologetic-looking, despite their size. I thought they were a really lame idea. 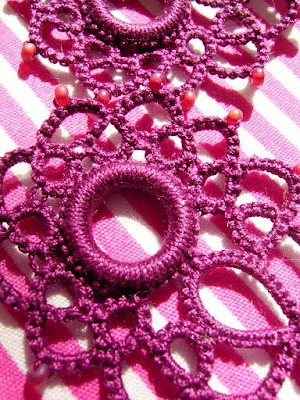 But then I got sucked into the online tatting world, and discovered the most beautiful things: intricate, dramatic, and very, very pretty. And then I won this pair in Krystledawne's giveaway! I can't get enough of them; I want to wear them all the time. 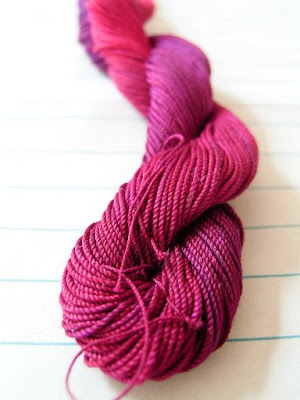 There's a lot more loveliness in her Etsy shop, where she also sells handpainted specialty tatting thread - and I was lucky enough to get some of that too. Tatting weekend, here I come! These are gorgeous! I'm such an earring girl, I think I need some of these. Wow, they are beautiful! Trying to make excuses why I would need to get some, Christmas gifts, birthdays, my birthday, Hmmm, yes my birthday. These are really lovely Jesse! The earrings are lovely! Lucky you to win some of Krystle's beautiful earrings! Her thread colors are pretty, too! F! these are so damn beautiful!!!!!! I think i must get some for me and my 2 sisters, each in their fav colour!!!!! Maybe you must have some competitions!!! these earrings look awesome! back then I made to my friends those "South America" bracelets..but I never though about earrings. I totally gonna make one to myself!